Anna Schowengerdt, a 1993 Whitworth alumna who has worked with Catholic Relief Services for more than a decade, will present "Humanitarian Aid: A Practitioner's Perspective," on Thursday, May 5, at 7:30 p.m. in the Robinson Teaching Theatre in Weyerhaeuser Hall at Whitworth University. Admission is free. The presentation will be the fifth and final lecture in Whitworth's 54th annual Great Decisions Lecture Series, which features five speakers who focus on current political, cultural and economic subjects of interest to the international community. For more information, call 777-3270. Schowengerdt has worked with Catholic Relief Services (CRS) for 12 years. During that time she has managed a food aid program in Liberia; served as senior program manager and acting country representative in Uganda, covering projects in agriculture, micro-finance, HIV/AIDS, education, emergency response and peace building sectors; and directed humanitarian response in Iraq. She currently guides the agency's acquisition of U.S. government and other public donor funds for relief and development programs around the world. Schowengerdt also helps with Catholic Relief Service's emergency response efforts. She managed the supply chain for CRS' initial response to the 2010 earthquake in Haiti, and she was part of the start-up team that established relief operations in Indonesia following the tsunami there in 2004. She holds a master's degree in international affairs from the University of Denver and a B.A. in international studies from Whitworth. 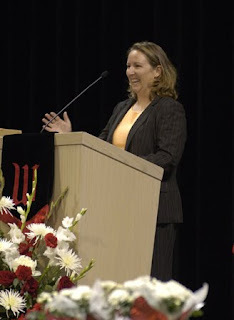 She received a Young Alumni Award from Whitworth in 2003. "Many of Whitworth's students hope to work for or support organizations such as Catholic Relief Services, and it will be valuable for them to have an on-the-ground perspective on development work and the significant challenges involved in providing aid to areas affected by famines, war and natural disasters," says Patrick Van Inwegen, an associate professor of political science at Whitworth. "As a Whitworth grad, Anna also will help students see how their work here can translate into a life of service that makes a difference in the world." During her visit to Whitworth, Schowengerdt also will attend a retirement celebration for longtime political science professor John Yoder on Friday, May 6. Schowengerdt, who was one of Yoder's students and has kept in touch with him over the years, says he has had a lasting impact on her life and career and she wanted to come pay tribute to him for his years of service to Whitworth students. Great Decisions 2011 is sponsored by the Whitworth Political Science Department.